Yes, it's true. The thing that I said that I wouldn't do, I did. For five years now, I have run away from the inevitable. Fly tying. For those that are new here, the River Damsel has hemmed and hawed for years now about starting up that vise and creating those little bugs that can be bought for $2 a shot. Now, I have come up with all types of good reasons not to do it. First, the cost. After buying the materials, are you really saving money? Second, the time. Isn't it much faster to stop in a shop on the way to the river than to sit down and tie a bundle up? Third, satisfaction of the end result. Wouldn't a store bought fly look better than my poor duplicate of a YouTube video fly? So, there are my excuses of the past. Not even the Midgeman, Cofisher, or the PondStalker could talk me into it... And I usually always listen to them. Go figure... Maybe I was just downright scared. So, I have started slowly, but surely. First, midges. Then scuds and sows. Then it was a beadhead olive hares ear, as I am getting ready for an upcoming trip to Montana. The one thing that Joe has taught me about tying is that you only need to tie up simple patterns. They usually do just fine in catching trout. No need to doll em' up with lots of fancy and expensive materials. No, I'm not going to be clipping off dog hair off of my Shitzu. Haha. I'm just saying that there are cheaper methods to get by in a fix or to make a pattern work just as well if you can't afford what is called for. Of course, there will be times that you might have to have that dreaded costly hackle or feathers... but, as I have shopped around, I have learned how to make things work a little cheaper. And I plan on keeping it that way for now anyway! Just having some fun and getting the basic things that I need ... (Is that what the gal who has 6 different fly rods said in the beginning) Haha. 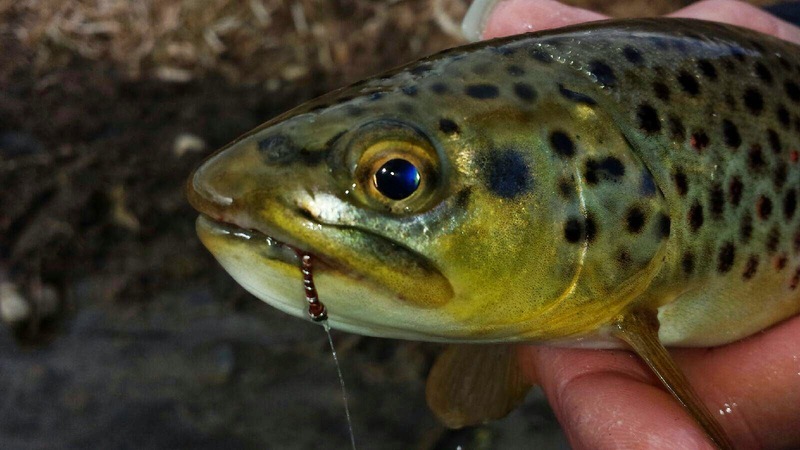 Every fish pictured in this post was caught on one of MY ties... Now, everyone said that it would feel like the most special thing in the world to catch on your own hand made fly. Ok. So, it was a nice feeling. Still wondering though, why in the heck they liked my novice creation, but I will take the end result! So far, all my midges, sows, and scuds have been proven worthy. Now, for the hares ear... it still has to be further tested. But, have no fear... then end is not near! Haha. Catching and releasing fish from my own handiwork. I believe in you too! Wait until you start tieing streamers! YEAH!! True story! 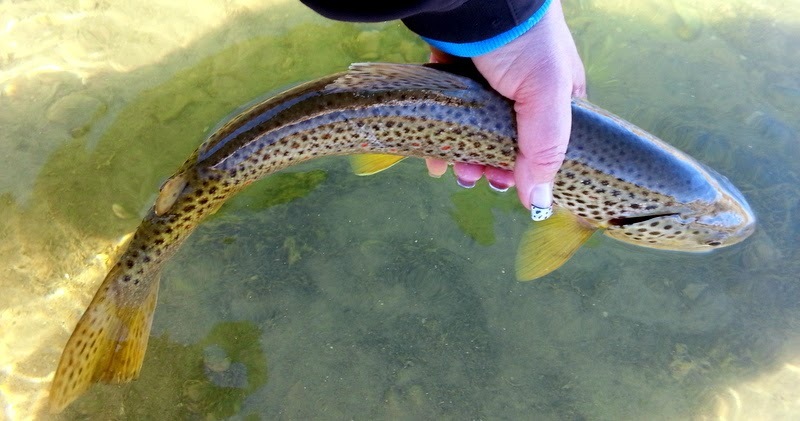 Streamers are the crack to fly fishing for me. Feeling that take is awesome! Brian ~ Bahahaha... Streamers. You're way funny. I'm sure articulated ones too... lol. Nick ~ The takes definitely have a different feel for sure... And there is nothing better than a photo with a big brown trout with a piece of meat hanging out of the corner of his mouth! Haha. Nick ~ How come I am always looking for "dumb" trout then? I thought most of them were smart. Hmmmm... J/k, I know what you are saying. Edible... I will remember that. We did post about fly tying, huh. Maybe what I need is professional help. Jay Fair once told me that all they need to do is look buggy. Mine don't even go that far. Maybe I need professional help. Oh, I said that already. 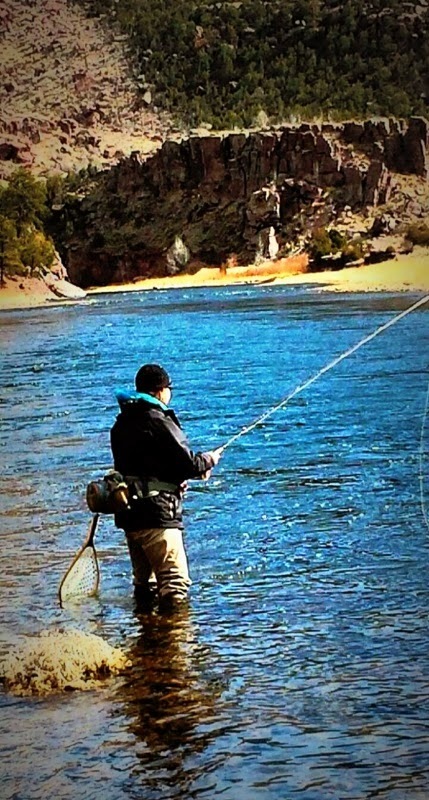 That's one of the great things about fly fishing - anyone can do it and you can make it as easy or as complicated as you like - and switch back and forth at will between the two! Those are beautiful fish! Thanks for coming by today, Owl... Always good to chat with you. We will stick to easy patterns for now and get them down pat before moving onto other stuff. My brain can only hold on to so much information. Lol. Tim ~ Gee, thanks??? I've been on the light side far too long... Time for a shot in the arm!!! What gorgeous fish and great ties! There is something fulfilling about catching a fish on a fly you tied. Making my jealous. Atlas ~ It has been so much fun. I love my fishies and now it seems that we have connected even more! = ) Go Jayhawks! Bill ~ You might as well join the ranks. It's hopeless to try and hold out on this one. As I said, I gave it my all for five years not to fall into the frenzy of fly tying. Now I'm here. And you should be too!! C'mon over... we will make room. RD, where to begin. First of all thanks for the link. I sure appreciate that even though I can't take any credit for pushing you over the edge! Secondly, congratulations on an expansion of your love for fly fishing. 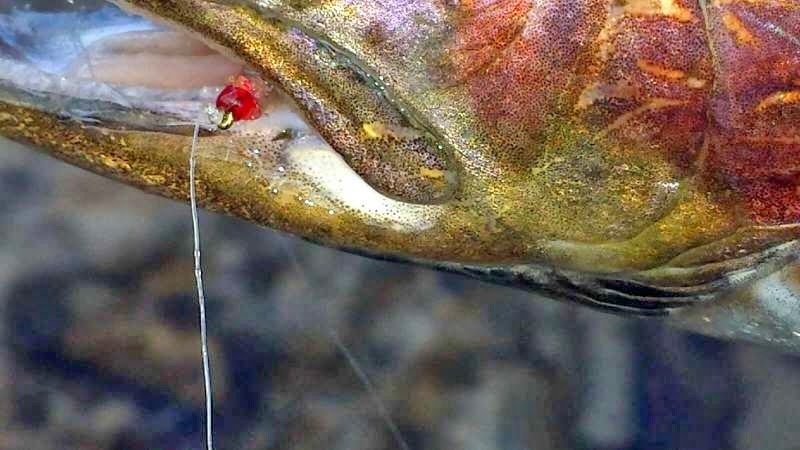 Fly tying is the "Thread" that connects us to fly fishing. When we experience those first few fish on flies we have tied, when you realized you have done it, then what a great feeling it is. Lastly, you commented that "Simplicity" is your middle name. I find it interesting that when you go to my blog, right underneath the picture header, you will find your middle name. I have know that for some time now! Mel ~ I have seen your feathered and furried friends... You have been at the tying game a long time now. So, the only thing that I ask is that you maybe, well maybe, share a few tricks of the trade with me??? = ) Thanks, Simplicity. I am available any time for questions or tips. 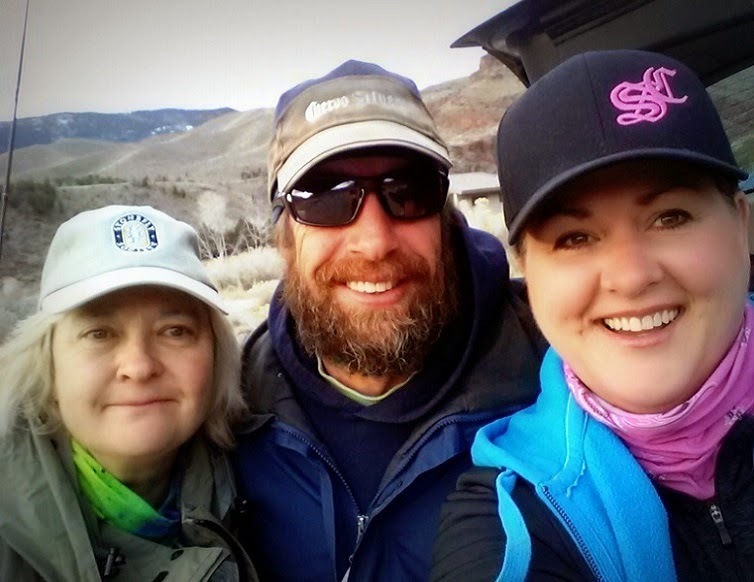 I would be honored to share a little bit of what I know with the newest tying Damsel. Maybe, I should crank out a little nymph in your honor. We will call it, "Simplicity"! Welcome to the club. There is a great sense of satisfaction from catching fish on flies you tied... something you'll never get from store bought or even ties by friends... it's a serious personal achievement. You are the complete fly fisher! Well young lady, all you need to do now is build your own rod. And Hey, where's my damsel? Thanks, Jerry. Come back anytime!